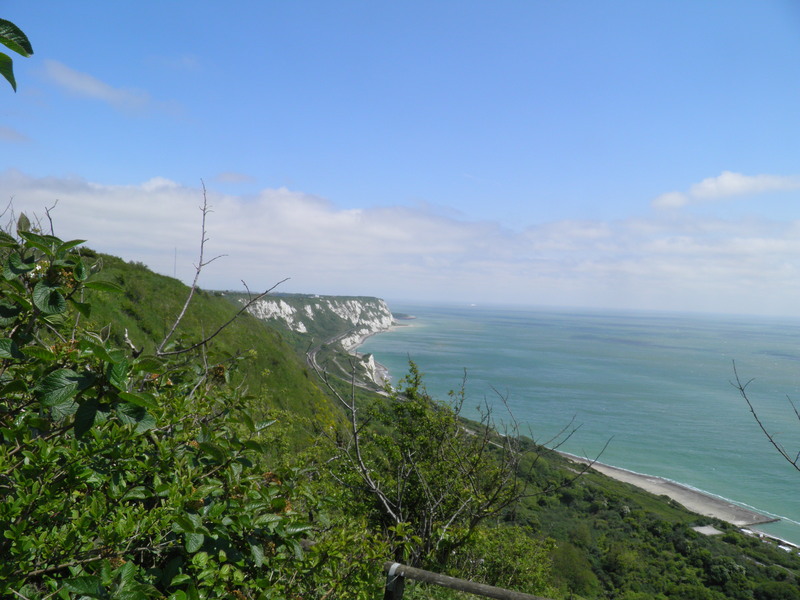 An incredible day’s walking, from the grassy hills of Shepway, up to the eastern end of the North Downs escarpment above the Tunnel terminal, on to the incredible, lush, isolated ecosystem of The Warren below the White Cliffs, and a grand finale of remarkable coastal scenery and Dover’s military heritage. A great way to spend a sunny day, enjoying the superb views. Underfoot: Mostly grassy paths with some minor roads. The exception is the descent, walk through and ascent from The Warren, where some of the paths are stony or rather overgrown, potentially slippery after rain. Terrain: Plenty of ascents and descents, some steep but few long. 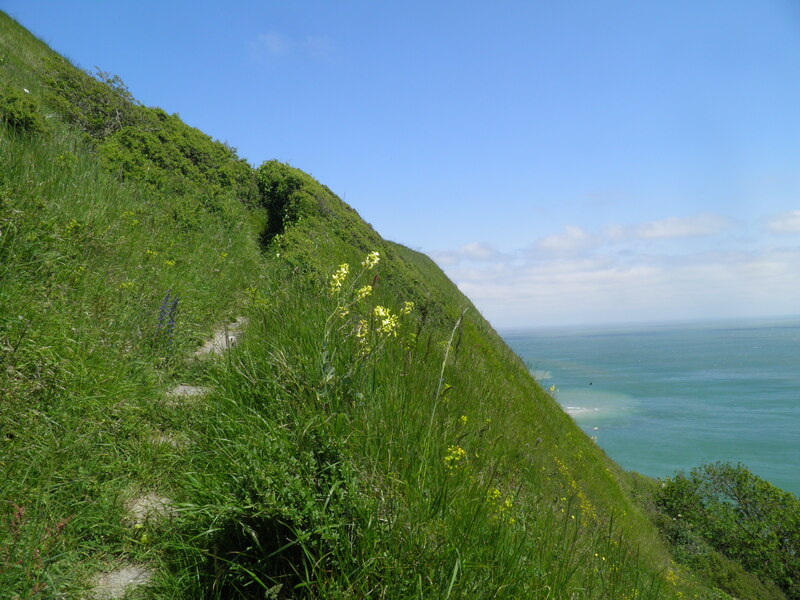 The descent to and ascent from The Warren are longer, stiff gradients on zig-zagging paths – if you wish, these can be avoided by sticking to the clifftop. 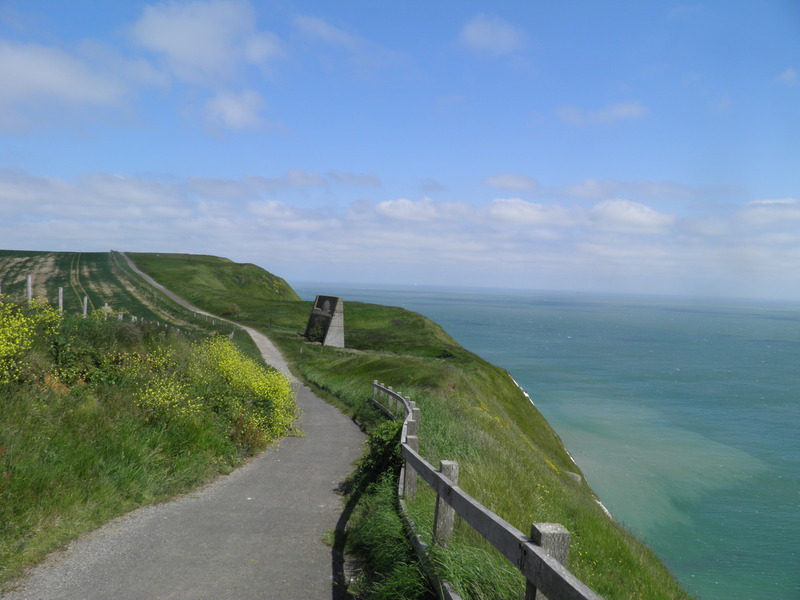 Clifftop paths mean this walk is best not attempted in mist or fog. Maps: 1:50,000 Landranger 179 Canterbury & East Kent; 1:25,000 Explorer 138 Dover, Folkestone & Hythe. 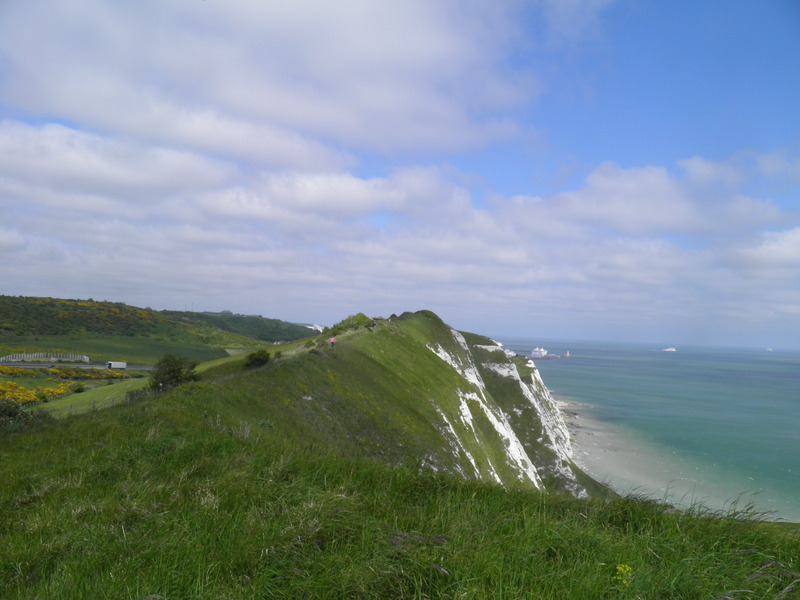 Useful websites: Much of the walk passes through the area covered by the White Cliffs Countryside Project and includes portions of the North Downs Way and the Saxon Shore Way. 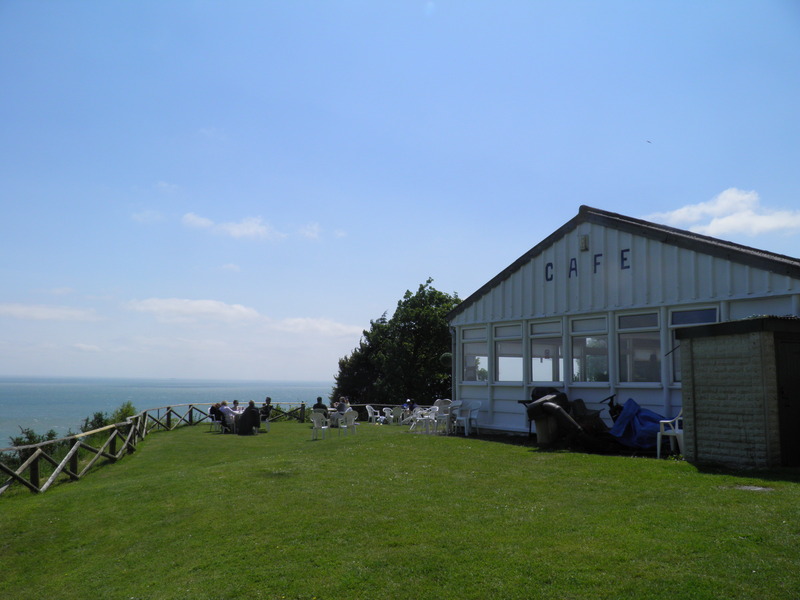 You pass near the artificial nature reserve of Samphire Hoe and the Elham Valley Countryside Centre & Railway Museum. Getting there: The fastest route to Sandling is to take the twice-hourly high-speed service from London St Pancras (38 mins), via Stratford International (31 mins) for DLR connections and change at Ashford International for the twice-hourly (hourly on Sundays) service to Sandling (11 mins) – total journey time is normally around 63 minutes. When changing at Ashford, take care to ensure you join the correct portion of the connecting train, as they usually divide there. The Sandling trains are through services from London Charing Cross via London Bridge – these services take over 1h40 mins, but do allow you to avoid the high speed supplement. Getting home: Dover Priory has an hourly high speed service to St Pancras (66mins) via Stratford International (59mins) for DLR connections. There are also significantly slower non-high speed services to London Charing Cross (via London Bridge) and to London Victoria. Fares: An off-peak return to Dover Priory, valid for the High Speed service will cover both journeys, for £37.50 (child £18.80, railcard £25.00). If you are happy to take slower services, the fare is a few pounds cheaper. the half-timbered ticket office. The strange bit of tarmac you emerge onto is the former branch line platform. Follow the ‘way out’ signs into the car park. 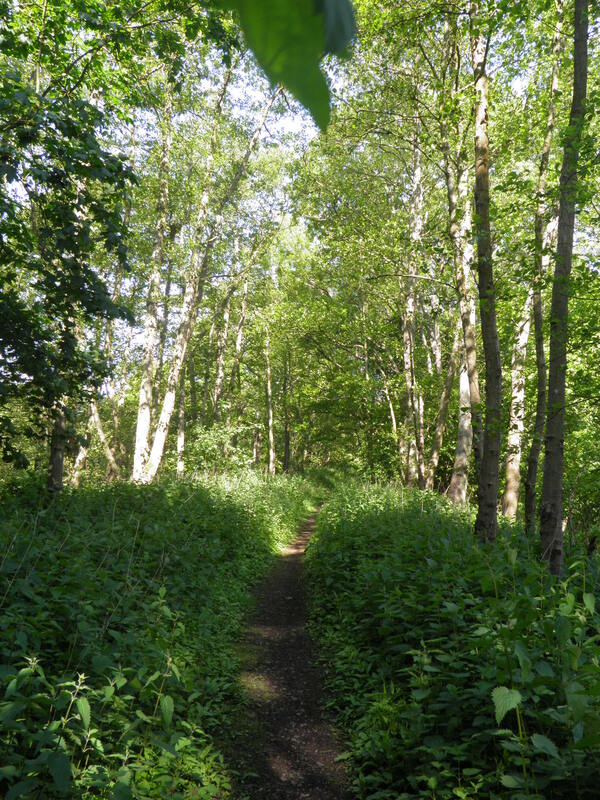 Walk to the far end of the car park and through an unsigned gate into the woodland – keep to the track ahead, the bed of a former railway. constructed. The station takes its name from a country house near the station – there is not really any settlement called Sandling. 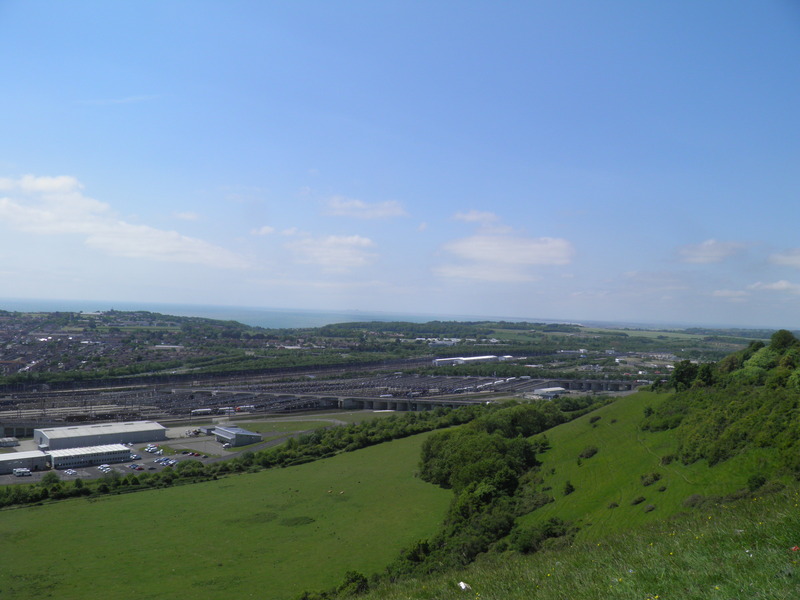 This branch line was originally intended as a route to the harbour at Folkestone, avoiding the very steep line down to sea level in the town itself. 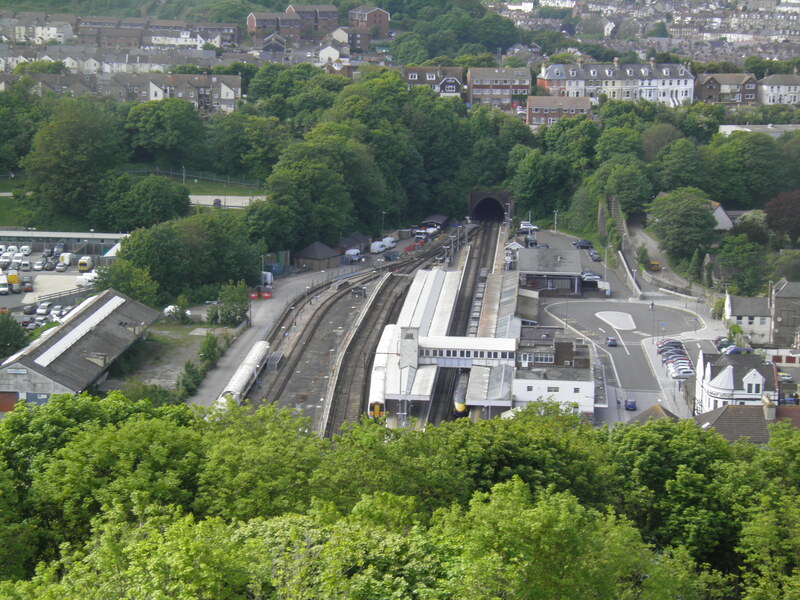 However, prominent residents of Folkestone insisted that if the line was going to pass along their seafront, it must do so through a tunnel, which made construction of the line completely uneconomical, so Sandgate (just east of Hythe) remained the terminus, and the original steep (1:17 gradient) line down to Folkestone Harbour remained in use until boat trains ceased with the opening of the Channel Tunnel. 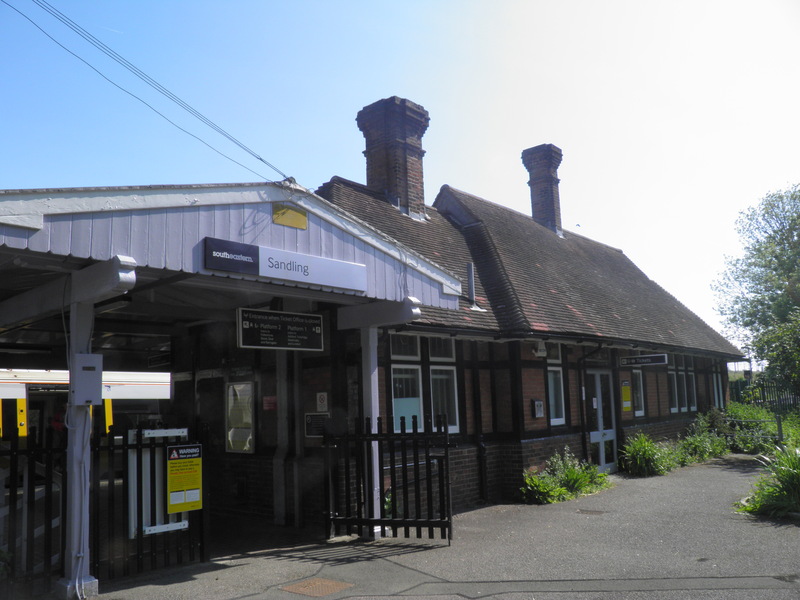 Without the extension, the branch from Sandling remained quiet and closed relatively early – it was cut back to Hythe in 1931 and closed completely in 1951. The line cuts across a small valley on a high embankment and immediately beyond you leave the trackbed , heading left up steps (the line itself disappears into a tunnel ahead). Beyond the top of the steps, you reach a t-junction with a bridleway (waymark post). Head left and keep straight ahead along this track, which becomes tarmaced as you pass some extensive orchards on your right, to reach a road junction  by the entrance to Hayne Barn House. Keep straight ahead on a tiny road, which suddenly emerges into the open next to the high speed railway, with views ahead to conical Summerhouse Hill and the North Downs escarpment. Cross the railway on the bridge ahead, immediately followed by the M20. Beyond the motorway, keep straight ahead to reach the A20, by a little wayside cross marking the site of East Sandling Camp. The Sandling area was home to two major troop camps during World War 1, known as West and East. East Sandling Camp was opened in 1915 and primarily housed Canadian troops, though as the inscription of the cross says, it was also used by RAF cadets, a Middlesex company and later by the Russian Relief Force, the British troops sent to northern Russia to support the counter-revolutionary White forces in 1919. This cross (or rather, a wooden original that was replaced in 1987) was put up after the war by local women who had served in the camp to commemorate those who had passed through, often never to return. hand of the two marked paths, beside the hedgerow. The very clear path twists through the large fields, gradually edging closer to Summerhouse Hill. Having followed the edge of one wood, the path then cuts right to reach a second, which it meanders along the eastern edge of. Beyond a stile you are climbing through grazed grassland. On reaching a stile on the left , do not cross but head right (no clear path, but a footpath waymark) towards the hill. Veer right to reach a pair of stiles through the row of scots pines below and follow waymarks through a gateway and along the southern foot of Summerhouse Hill. As you crest a rise, you get your first glimpse of the Channel through a gap in the hills to the right. Ignore the paths signed off on either side and descend straight ahead through two gateways to eventually reach the Etchinghill road. Cross with care (visibility is poor to left) and pass through kissing gate opposite. Do not cross stile ahead, but follow waymarks right on a path beside the fence. Just before you reach the A20, drop to the left on a sunken path which soon becomes a minor road, twisting through the delightful houses of the hamlet of Frogholt. kissing gate . Follow the left hand of the two marked rights of way, cutting diagonally across the field towards the right hand corner of the wood ahead (there are no footpath signs until you reach Peene. This area is sometimes used for military training, but not using live ammunition, so is never closed to the public). By the corner of the wood you cross a small ditch and continue diagonally across the grass. Reaching the end of a row of trees, cut across the next field towards a large gateway near the houses of Peene. Do not pass through the gate, but keep beside the left hand fence to reach a stile leading onto a road opposite the large barn that houses the Countryside Centre. moved here to form part the Elham Valley Line Trust’s base – it now contains craft workshops and a cafe. 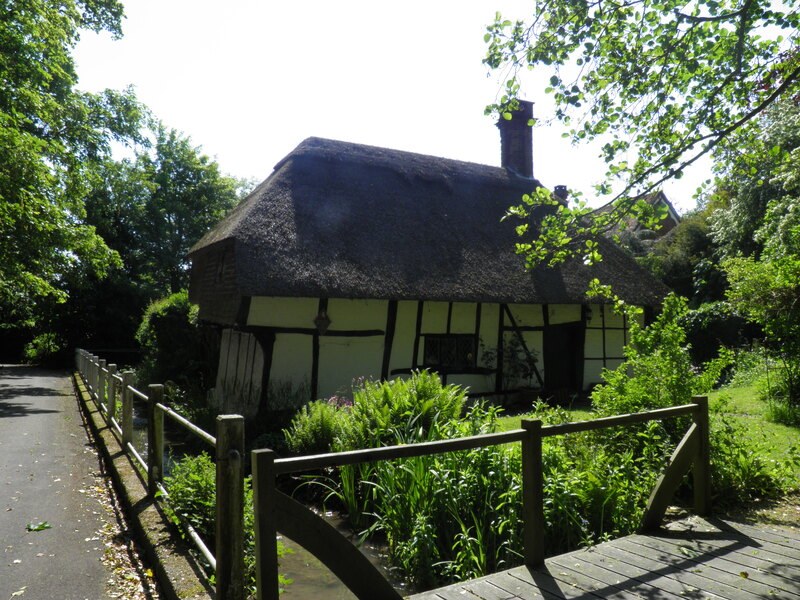 The Trust aims to preserve part of the history of the former Elham Valley railway line which ran over the embankment behind the barn on a meandering rural course between Canterbury and Folkestone. Linking small villages, it struggled as a commercial proposition and closed in 1947, though had a brief moment of glory during World War 2 when it was the base of a huge rail-mounted gun called the ‘Boche Buster’ that could fire shells 12 miles and was hidden in one of the line’s tunnels when not in use. 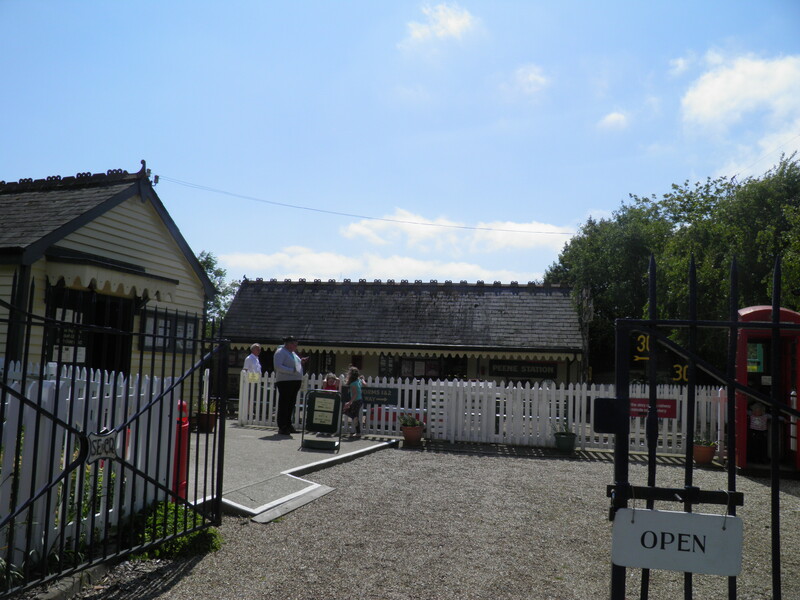 The Countryside Centre is linked to the railway museum on the other side of the old line, which includes a replica station and signal box, although Peene itself never had a station. museum just beyond. 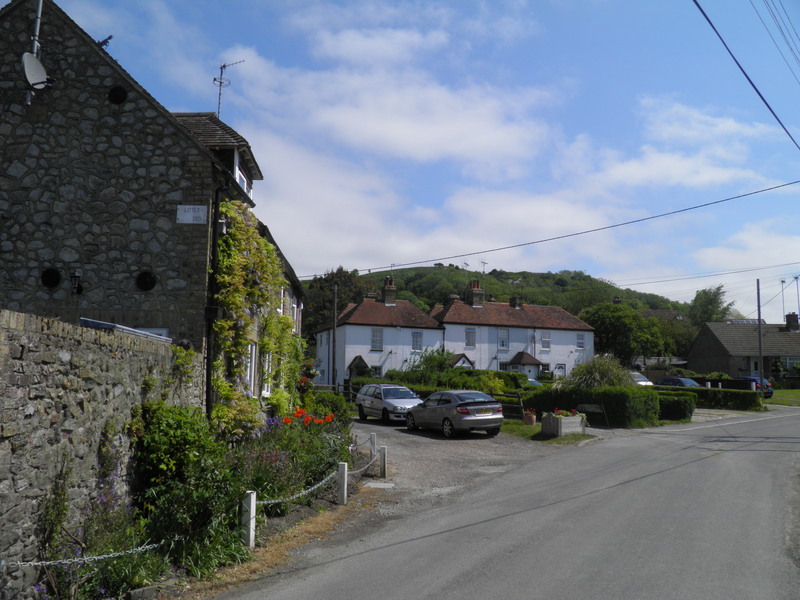 Continue through Peene – a village that is half pretty cottages, half 1960s estates – and at the end of the houses continue around the sharp bend to the left  to begin climbing towards the escarpment. At a road junction after a steep corner keep right on another minor road (whilst very quiet, this road is also very narrow, so keep an eye out for traffic), at first dropping slightly, then climbing steadily to reach another road junction at the top of Cheriton Hill. 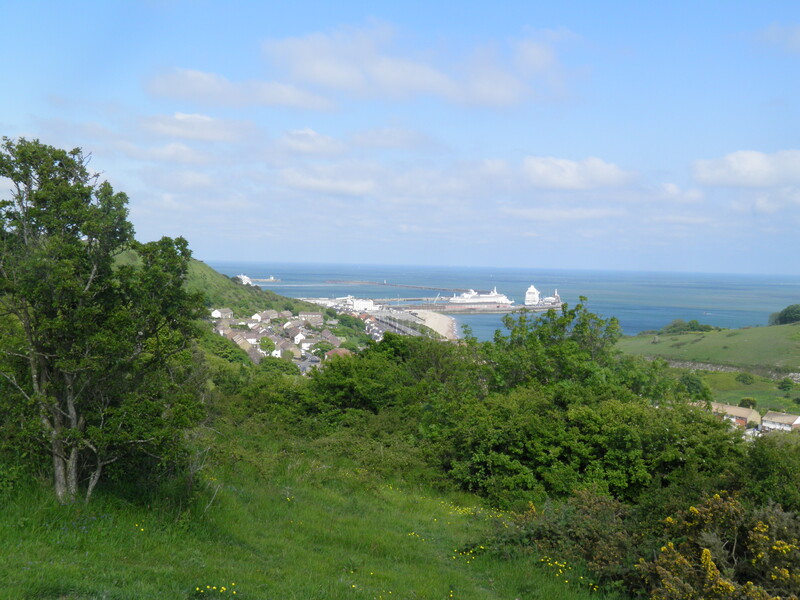 Keep straight ahead to reach a small car park  with stunning views over the Tunnel terminal and Folkestone, as well as south to Dungeness with its nuclear power station and on a clear day, to France. pull out of the Tunnel and run along the far side of the site and then around a loop before pulling into the loading platforms that you can see immediately in front of you, to save the trains from reversing. Meanwhile, Eurostar passenger trains and the occasional conventional freight train run along the far side of the site on their way to and from London. Pass through the kissing gate and head left along the hillside path paralleling the road, a superb stretch of chalk downs, rich with wild flowers. 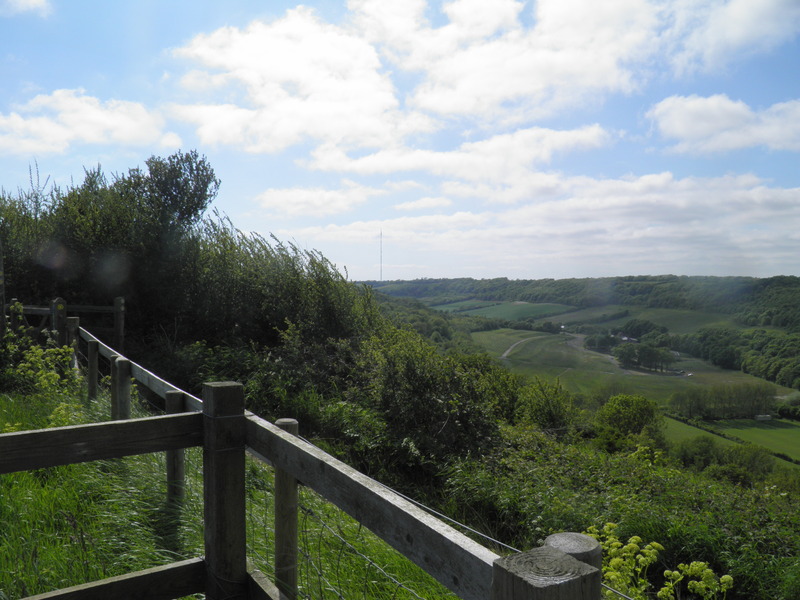 Keep to this fine path, following North Downs Way (NDW) and Saxon Shore Way (SSW) waymarks. Above the end of the Tunnel terminal, path and road veer away from the escarpment edge and there is a fenced section through woodland. 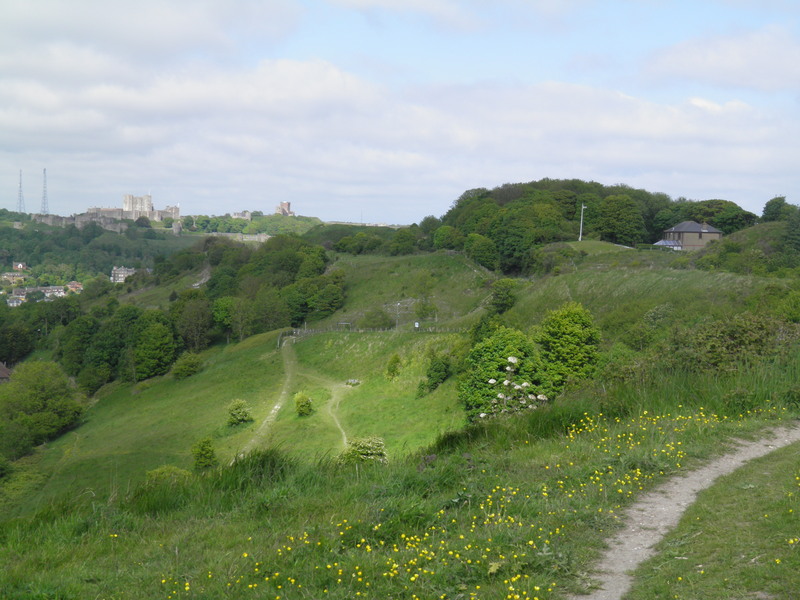 Emerging at a road junction , follow the NDW signpost right (signed to Folkestone), along a fenced path curving round towards the earthworks on Castle Hill. As you climb the chalky path up the hill, you pass over the mouth of the Tunnel. 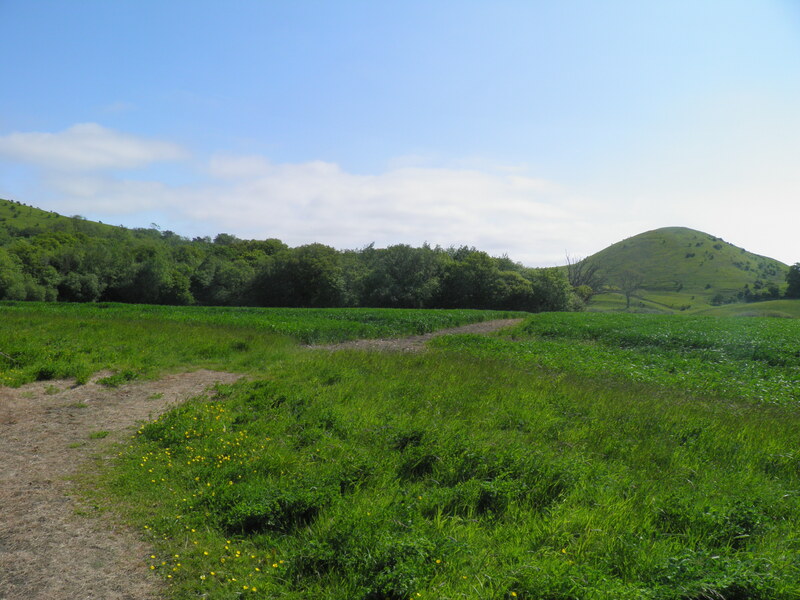 The impressive earthworks on Castle Hill are all that remain of a late Norman ring and bailey castle – i.e. 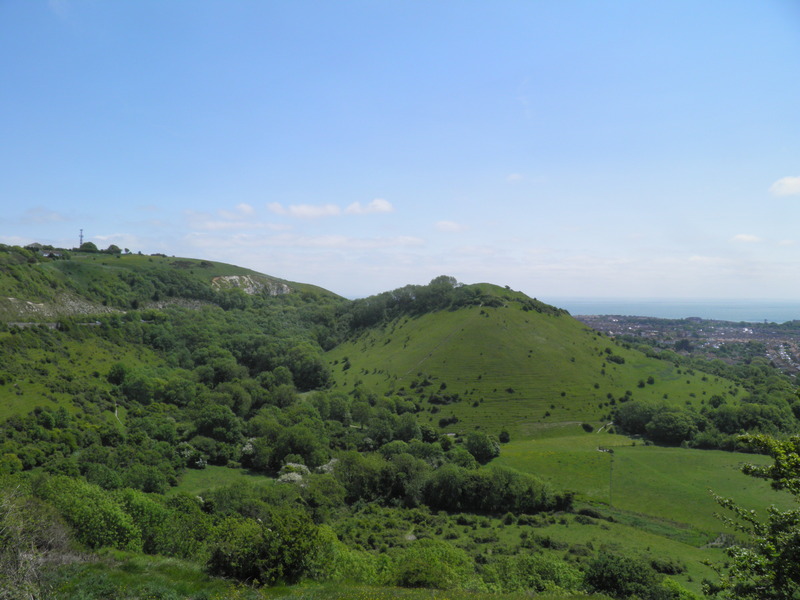 with a ring of defensive earthworks surrounding a hilltop castle, built in the 1140s. Although this hill is locally (and on Ordnance Survey maps!) known as Caesar’s Camp, there is no evidence of any Roman settlement here. through the outer earthworks on a broad grass path towards a row of modern houses. 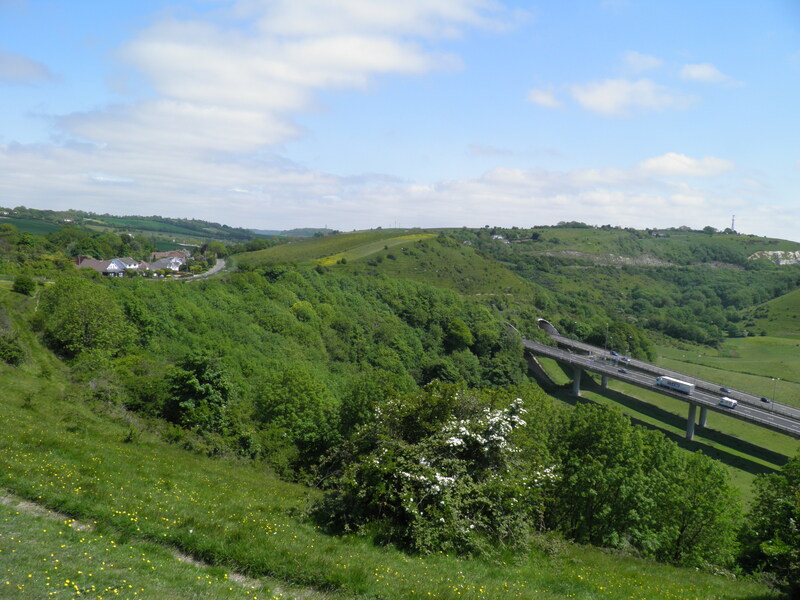 Below you, the A20 roars over a viaduct and into a tunnel under the Downs. 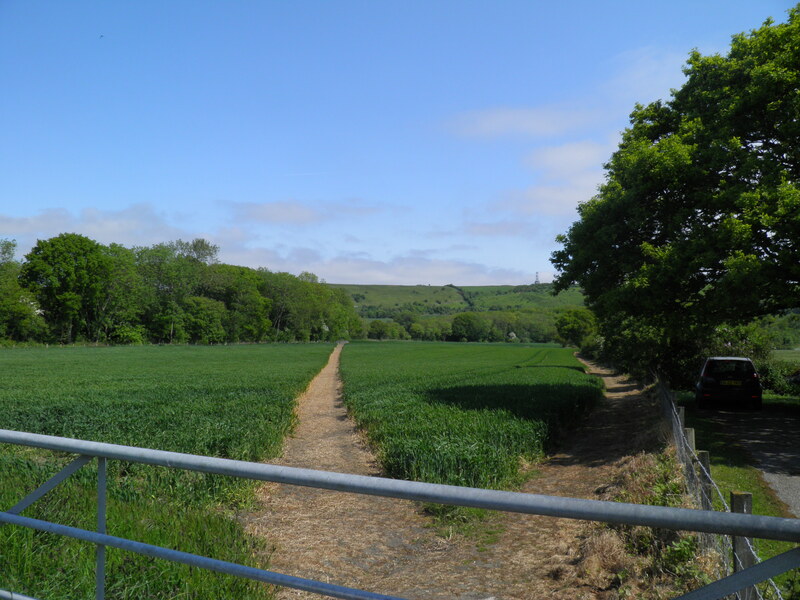 The path briefly runs beside the hilltop road again, keeping ahead through a kissing gate  to leave the road and climb briefly to the top of Round Hill. Descending, with good views of Sugarloaf Hill, pass through a kissing gate. Do not pass through the second , but take the path heading right beside it (NDW) to reach the busy A260. 400m, you can turn right through a kissing gate by a NDW signpost, to again walk on a path paralleling the road as it returns to the escarpment edge. Past a radio mast, you emerge at a road junction . Keep straight ahead and immediately return to the field on the right, keeping close to the road towards a hilltop pill box ahead. You continue to the trig point at the top of Dover Hill, from where you get some of your final views of Folkestone. A little beyond, you emerge on the B2011 opposite the Valiant Sailor pub. Cross the road with care and take the path beside the pub (NDW towards Dover). Ignore the waymarked path dropping right, and follow NDW waymark, shortly afterwards swinging left beside a metal fence. The path, sometimes a little overgrown, zigzags spectacularly down the lush cliff face. Where a waymark points you right, ignore it and turn left, immediately heading down concrete steps to a cafe , with a well placed terrace, part of a caravan site. Turn left along the back of the cafe, and keep straight ahead on a grassy path past an information board and warning sign. Continue to descend down steep steps into the heart of The Warren. Once the steps end, this lovely path wanders through this remarkable ecosystem, rising and falling, seemingly endlessly. 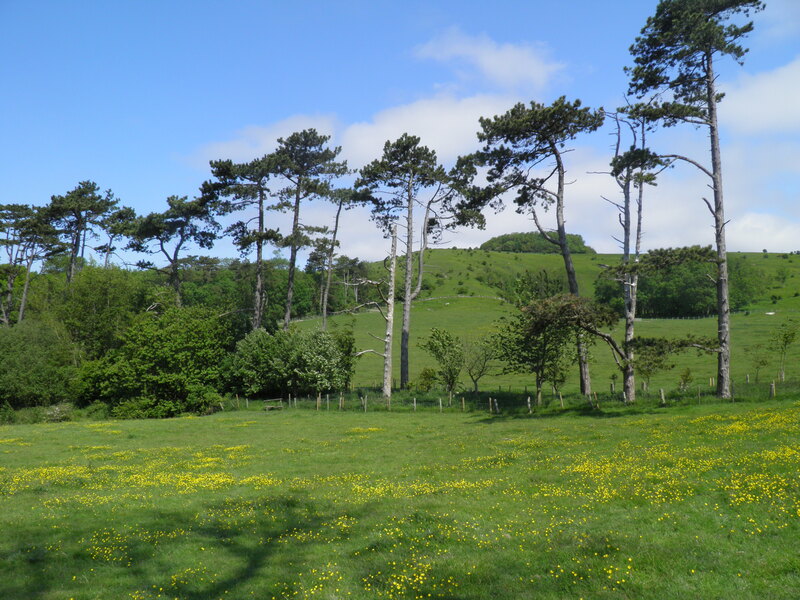 a site of special scientific interest and is home to many rare species of plant, insect and butterfly. 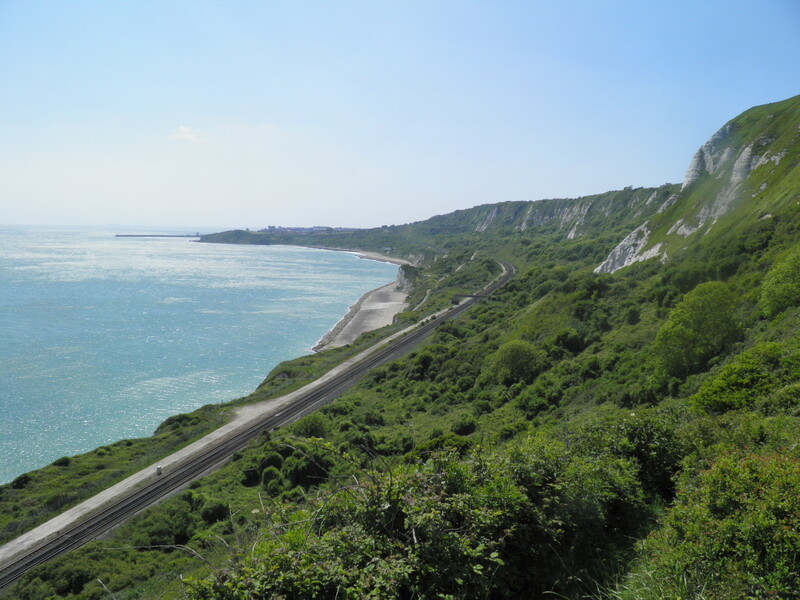 The spectacular stretch of railway line that takes advantage of the Warren as an easy portion of its cliff-base route from Folkestone to Dover was opened in 1844, as part of the South Eastern Railway’s main line from London. 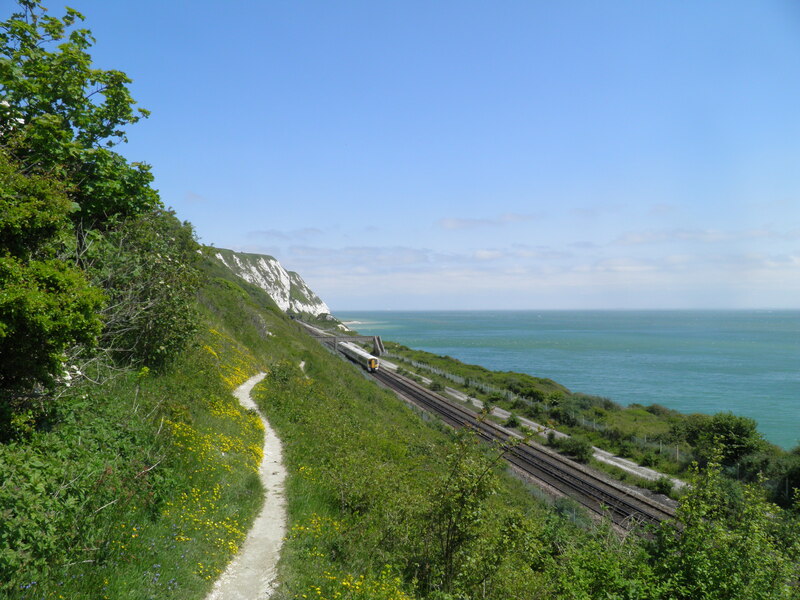 In 1886, an isolated little station known as Folkestone Warren Halt was opened in the Warren, allowing visitors to picnic on the beach. The halt had a precarious existence, however, closing after just a few months after objections from the then owner of the Warren, Lord Radnor. It did not re-open again until 1908, lasting until 1915 when the last huge landslide occurred when 1.5 million cubic metres of chalk from the undercliff buried the halt, the railway and very nearly, had it not been for the fast actions of a railway watchman, the 6.10pm from Ashford to Dover. It took four years to re-open the line, but during the inter-war years The Warren became a popular spot for day-trippers. Nevertheless, a small landslip damaged the halt again in 1939 and, with the onset of war, it never re-opened to passengers. It is something of a surprise to suddenly emerge in the open beside the railway line . Head left on the path beside the line, which briefly sticks beside the railway before dropping left and once again meandering through the woodland. Ignore a path that heads left  and you eventually return to the railway line, a little before a footbridge. On reaching the bridge , you can cross it if you want to drop down to dip your toes in the sea. Otherwise keep straight ahead on the narrow path above the railway. Eventually, the path turns uphill and begins to climb steep, zigzagging steps. Surprisingly suddenly you emerge on the cliff top path, by a caravan park. Turn right along the exposed cliff, the path soon practically tunnelling through some bushes. Emerging by some fields, the NDW is signed to the left . Ignore this and follow the waymark straight ahead along the side of the cliff below a group of houses. This path climbs to a WW2 gun emplacement where you join a narrow metalled track , just back from the cliff edge. This drops to a sound mirror then climbs again. Britain in significant numbers in the run-up to World War Two, prior to the invention of radar, to detect the approach of enemy aircraft by amplifying the sound of their engines. Microphones placed in the spherical section would relay the sounds, giving early warning. They were, however, largely obsolete by the mid-1930s, as increasing speeds of aircraft meant they no longer provided any useful advanced warning. 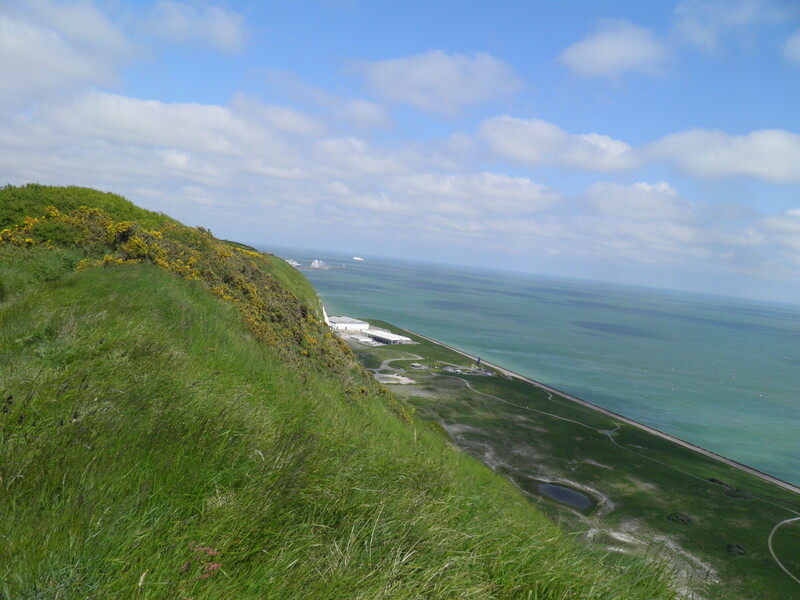 The specimen here at Abbot’s Cliff is relatively small – much larger examples survive in the Dungeness area. Beyond the hill top, you reach a gate . Here follow the NDW waymark right to a footgate and back onto a cliff top path – it is easiest to not pass through this gate and instead to follow the seaward side of the fence. 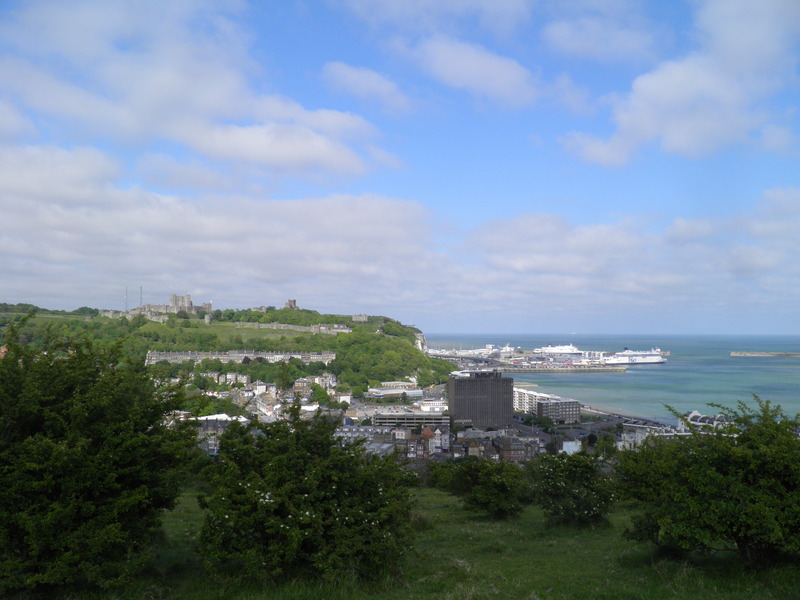 You get your first glimpses of Dover Castle ahead from here. Keeping by the fence, you pass a ventilation shaft for the railway tunnel far below. 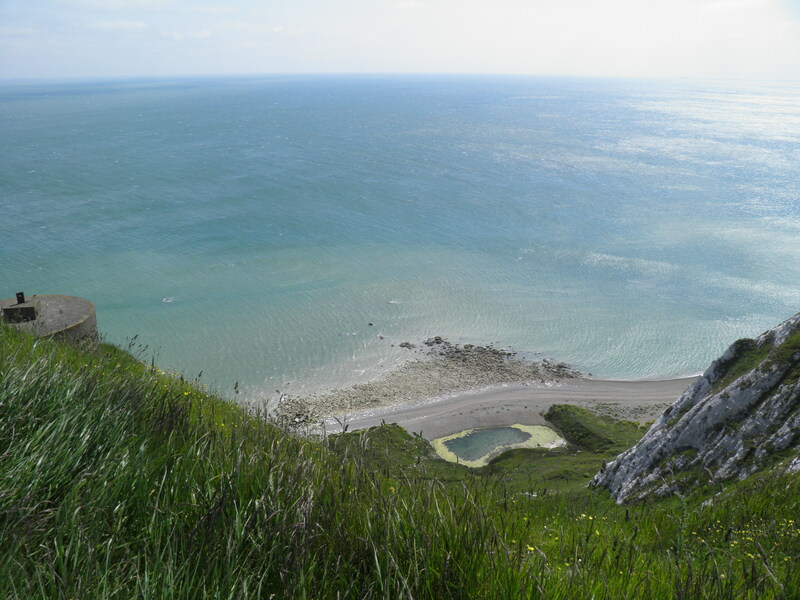 As you curve around the cliff top, views open up to Samphire Hoe and beyond to Dover’s breakwaters. considered to be the most ecologically-friendly way to dispose of the waste, which was brought here by rail. A chalk meadow land has been created and the landscape is gradually maturing, and there is a visitor centre and cafe on site. Part of the Hoe is covered by buildings housing part of the Tunnel’s ventilation system. Access to the nature reserve is via a road tunnel under the cliff – originally part of mine workings. If you want to visit, simply turn left to reach the tunnel when the route comes alongside the A20. and a small valley carrying the A20 on the other. 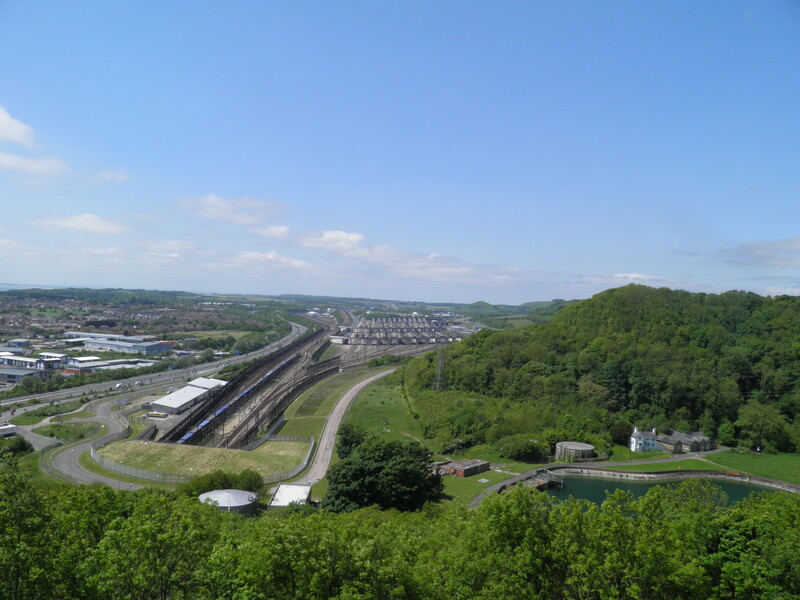 You reach the summit at Round Down and descend steeply to another railway ventilation shaft. Keep to the cliff top, passing a NDW stone marker and a cylindrical trig point. Just after the path begins to descend again, turn left through a kissing gate  (ignore NDW market straight ahead) into access land. Take the path dropping straight ahead towards the dual carriageway. At the bottom, do not pass through the kissing gate to the left but turn right to another kissing gate. 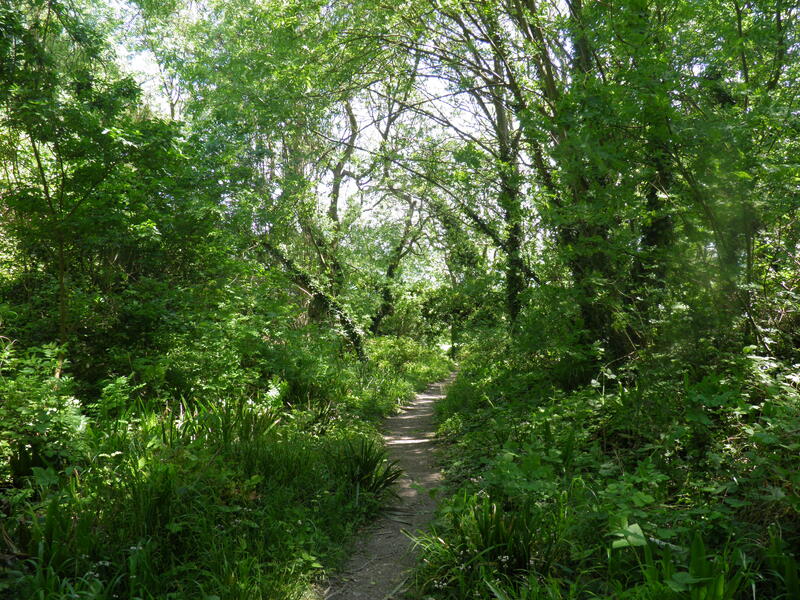 This leads onto a gravel path, climbing beside the A20 to the footbridge ahead . bottom of the bridge approach path keep straight ahead, passing though the kissing gate onto the gated off road ahead (footpath waymark). After about 20m, turn right up a fenced path  climbing straight up the hillside (no sign here, but you soon pass an information board). Through a kissing gate, continue to climb straight ahead. Eventually, you are forced to pass right through a kissing gate and follow the path ahead along the hillside. The main path soon begins to climb slightly, heading towards the citadel buildings on the hilltop ahead. 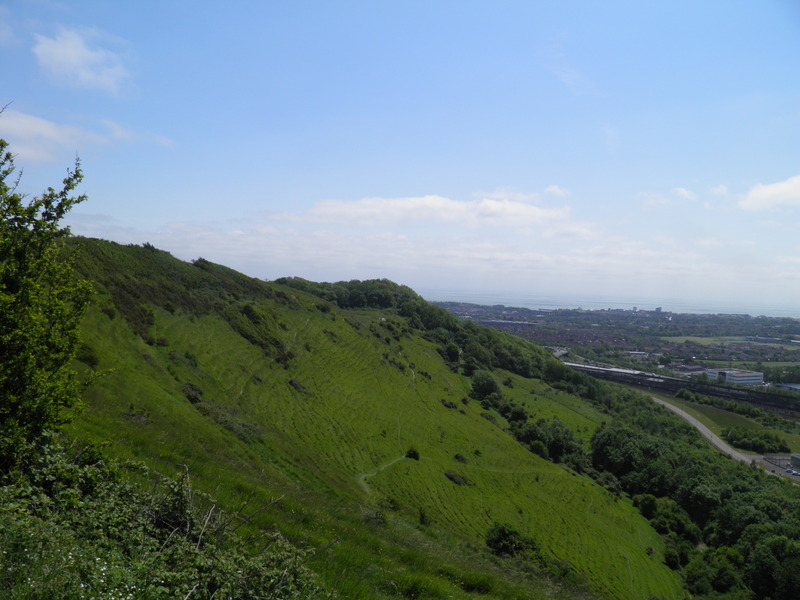 views of the tentacles of Dover running up its various valleys. Turn right, ignoring the footpath signed left, and pass through the gate ahead, onto a path passing various ruined concrete gun emplacements. out and all work ceased. Renewed threats of European war from 1850 onwards saw work recommenced and the Citadel was completed, capable of housing 40,000 troops. More recently, it served as a young offender’s institution and is now an immigration removals centre. 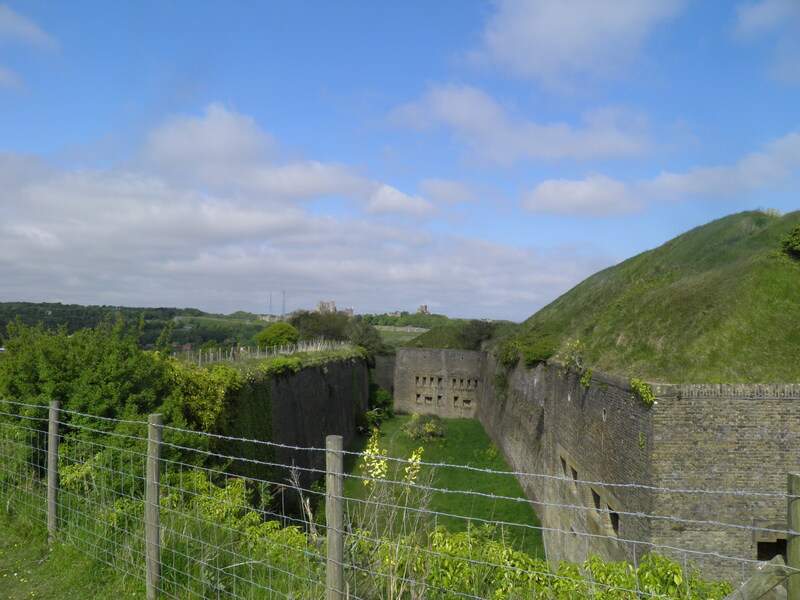 Keep to the clear path beyond the emplacements, skirting the high fences of the citadel and passing through a kissing gate to run along the hillside. The path descends a little then forks – take the right hand path which soon begins to climb gently again. You pass a corner of the citadel’s defensive ditch  and pass through a kissing gate, suddenly getting an excellent view of the castle on the next hill. Look out for a short flight of wooden steps climbing to the right, and take them, keeping to the narrow but clear path beyond along the hillside. You swing around another corner of the citadel fortifications then descend steps. Beyond a kissing gate you climb steps again then drop to a former entrance to the citadel . Head along the road and on reaching the main road at the end of the car park , cross and take the footpath climbing opposite (NDW). Where the path splits keep left up the steps. Beyond a kissing gate keep straight ahead along the hilltop, passing the well preserved redoubt on your right. As the path swings right, a superb final panorama opens up over the town, castle and port. 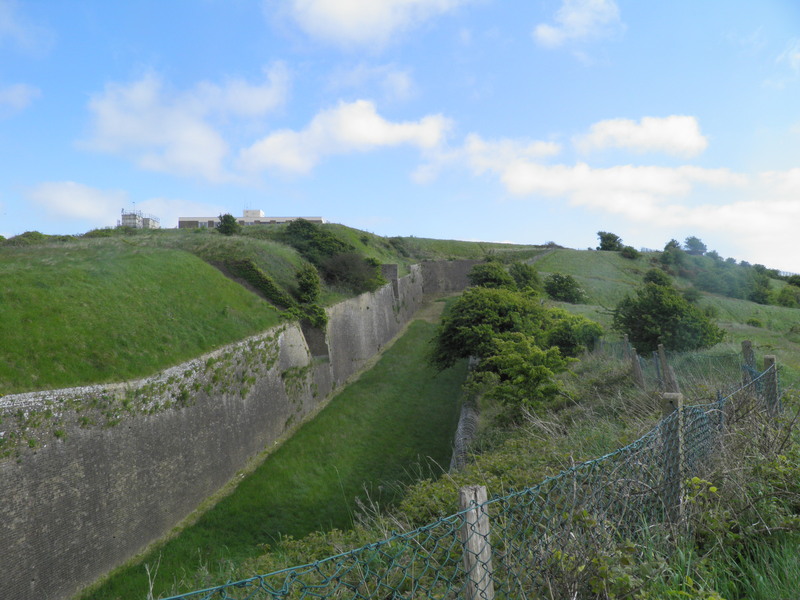 The redoubt – known as Drop Redoubt – was also built during the Napoleonic Wars (and completed before they ended! ), with further work being done to expand it in the 1850s. Immediately after the sharp corner to the right , drop steeply left on a faint path across the grass. Keep dropping until you reach a faint crossing path just before the fence line. Turn left and you quickly reach a steep flight of steps, dropping down the hillside towards a group of college buildings ahead. At the road at the bottom turn right. By a road junction , take the footpath signed left, descending steps to the next road down. Turn left, crossing at one of the traffic islands and take the first road on the right to reach Priory station.